Can I create a custom error pages like 404 and 403 error pages? Yes, VIP PowerNet Web Hosting customers have the ability to create customized error pages such as 403 and 404 error pages. Yes. Our services are compatible with Paypal for linking to the Paypal payment processing interface page. Can I use a web cam on my VIP PowerNet website? VIP PowerNet has no restriction on the use of webcams however if the update frequency is high (more than 1 update per hour), the use of a webcam may use disproportionate portion of the FTP server resources which may affect other Members' use of FTP. If this is the case the webcam must be removed from the website to continue using VIP PowerNet service. Can I use password protected directories or files with VIP PowerNet service? Yes. Customers who use our FrontPage extensions, CGI, PHP/MySQL or other hosting optional features will have access to password protected directories functionality. These features can be ordered from Member Section. Do you offer e-commerce support? We recommend the use of the osCommerce shopping cart which offers connection support forPaypal or any other payment gateway processors of your choice. osCommerce is an online shop e-commerce solution under on going development by the open source community. Its feature packed out-of-the-box installation allows store owners to setup, run, and maintain their online stores with minimum effort and with absolutely no costs or license fees involved. Please visit http://www.vipwh.com/oscommerce.htm to view our installation tutorial for osCommerce. To conduct transactions securely, you will have to purchase a SSL certificate for your store to encrypt the transmission of sensitive data. Do you provide statistical information or log files? Yes. VIP PowerNet provides online statistics and log files to all customers which use our FrontPage extensions, CGI, PHP/MySQL or optional hosting features. These features can be ordered from Member Section. Does VIP PowerNet have a hit counter I can use on my website? Yes. The VIP PowerNet Web Tools included free with every account does include a hit counter tool which can be installed on your web pages. As an optional feature, VIP PowerNet also provides online statistics which provide you with details site access and traffic information about your website. This feature can be previewed and ordered from Member Section. Does VIP PowerNet offer web design services? Does VIP PowerNet support SSL (Secure Sockets Layer) enabled hosting? Yes. VIP PowerNet Web Hosting service supports SSL hosting. We can install an SSL certificate for you if you are using this service. Does your service support Real Audio or Real Video streaming? VIP PowerNet does not currently support Real Server streaming at this time. However you may use Real's HTTP streaming protocol which is compatible with our services. How can I get the FrontPage extensions added to my account? The FrontPage extensions are is available feature with our hosting service. How can I submit my site to search engines? Please have a look at the Search Engine Watch document on search engine submission tips located at: http://www.searchenginewatch.com/webmasters/index.php. How do I program in HTML? If you are new to web building, you may wish to use a web composer program like Microsoft FrontPage and Macromedia Dreamweaver to build your website. These web composer programs will handle the conversion of your website design into HTML. How should I name my web pages: .htm or .php? There is no difference between .htm and .php pages. The server will recognize both of these file extensions. For consistency, you should name all of your web pages as .htm only or .php only. I can't see the pictures on my website. There is a broken triangle displayed. Make sure that you've uploaded your images and put them in the proper location on your web server. For further Help on Uploading, please go to our Tech Support Tutorial section. Is 500MB enough space for my website? 500MB of web storage should be adequate for most websites. Based on an average page size of 50KB, 500MB can hold 10000 pages. If you feel that 500MB is not enough, you can consider subscribing to the other hosting plan offers higher storage space. Also you can order additional disk space if you required. 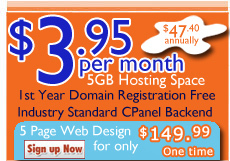 Check out Shared Web Hosting section for plan and pricing details. Is 50GB of Traffic Allowance per month enough for my site? 50GB (gigabyte) of traffic allowance should be adequate for most websites. Based on an average page size of 50KB, 50GB is equivalent to 1,00,000 page views. If you feel that 1GB is not enough, you can consider subscribing to the other hosting plan which includes 20GB of monthly traffic allowance. What are VIP PowerNet Web Tools? The VIP PowerNet Web Tools are a set of free tools provided to all VIP PowerNet clients the enhance website capabilities. They allow you to clients to create dynamic database driven web tools such as hit counters, email forms and guestbook, etc. 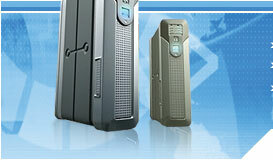 VIP PowerNet Web Tools are accessible by all VIP PowerNet clients from within VIP PowerNet Member Section. Login to Member Section to activate your Web Tools today! For more information on how to use and install the Web Tools, please refer to the Tech Support Tutorial. The pre-packaged functionality lets users incorporate these advanced features without having to write the complex server-side programs typically required. Click here to find out more about Microsoft FrontPage and view example sites. You may upgrade your hosting service at any time. Please login to Member Section and select the Upgrade My Hosting Service option. What is account traffic? Is it possible to buy more traffic allowance for my account? Account traffic is the total amount of data served by your web server to your website viewers. We have imposed a limit of 20GB (=20000 MB) of monthly traffic for each account which is equal to 1,00,000 page views based on a 50kb page size. Yes, you may purchase additional traffic allowance from Member Section. What is the difference between index.htm and index.php? Both index.php and index.htm are the main page for your website. This is the first page that your visitor will see when they view your website. The only difference between them is the file extension. You can name your HTML pages as .php or .htm. What software tools can I use to design my website? Which is better? FTP or FrontPage? FTP is the industry standard and is primarily used by people familiar and comfortable with HTML. It is a means to upload your files onto a server. We recommed the use of WS_FTP LE. In using FTP, one has to organize his files on his own. On the other hand, FrontPage is fairly convenient and normally used by novice site builders who prefer the templates and a graphical interface. FrontPage can upload the files onto the server in an organized manner but the server has to have the FrontPage server extensions installed. Will VIP PowerNet submit my website to search engines? Search engines such as Google use spiders to crawl the internet and find new sites. They will be able to find your site and categorize it based on keywords, context and number of hits. You do not need to submit your website URL to Google.